The article is actually specifically giving props to iRadio, which I didn't realize before. Very cool. With entertainment content emerging as a priority for the wireless industry, the mobile phone is becoming an important element of the value chain - a consumer electronic device in its own right - rather than just a device to access a network. 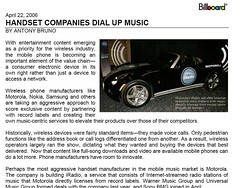 Wireless phone manufacturers like Motorola, Nokia, Samsung and others are taking an aggressive approach to score exclusive content by partnering with record labels and creating their own music-centric services to elevate their products over those of their competitors. Perhaps the most aggressive handset manufacturer in the mobile music market is Motorola. The recently launched StudioMOTO and the upcoming iRadio service are nice examples of this. Nice job, Motorola team. UPDATE: Thanks to a reader, we now have more than an excerpt! You can now see an image of the iRadio Billboard article. iRadio to Charge $10 Per Month? Sony BMG signed with iRadio last month (Warner and Universal aren't the only labels who've joined). I'll be going on a camping trip in a couple months that will revolve around Geocaching. Geocaching is most simply described as a treasure hunt using a GPS device to navigate and locate "treasure," or "geocaches." Geocaches are hidden by anyone who is interested in doing so, and the location coordinates are posted online for anyone to see and find. As it will be my first time, I did a little research -- apparently, Wikipedia credits Dave Ulmer for inventing the sport. Could this be the very same iRadio Dave, Sr. Director of Marketing for the Digital Media Solutions Group at Motorola? :) Probably not, but I thought it amusing. This is probably part of Motorola's push to generate additional brand awareness and and further differentiate the services it provides. 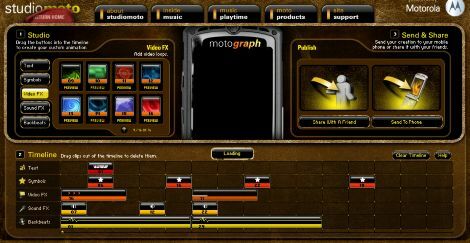 StudioMOTO includes a "MOTO Products" section to introduce new gear to consumers, and an "Inside Music section, which is basically a news feed taken from Rolling Stone. Amp'd Mobile's entertainment-focused mobile service (an MVNO using Verizon's network) is now up and running. Three different phones are currently available, the most premium of which is the Motorola Hollywood, an enhanced version of the Motorola E816. CNET recently published a review of the Hollywood here, giving it decent marks (7.6 of 10). CNET gave the phone high marks for the phone's user interface, call clarity, and fluid navigation, but commented on the touch-and-go EV-DO reception and occasional tendency freeze up when accessing Amp'd Live (the media browser and player). Not bad for a first shot. MVNOs in general seem to be facing a lot of challenges launching their services. It will be interesting to see how Motorola iRadio will compare against entertainment-focused services such as Amp'd. The team at Engadget scored a few photos of the upcoming Motorola Canary (RAZR 2) from someone calling himself the Boy Genius For Engadget (a groupie, I assume)-- you can check them out here and here. Ok, not exactly. But someone at Motorola believes vibrating rings are not quite silent enough, and that a less acoustically obtrusive means of alerting cell phone users of rings is necessary. The solution: apply mild electrical shocks to users. Methinks this new "silent" ring may very well create not-so-silent reactions in the users, if the shock is substantial enough. Personally, it's not an option I would select, no matter how courteous I'm trying to be. When a scenario demands silence, I just turn my phone off. Wouldn't a lightweight wristband that generates heat/light/vibration, or something similar, be a more pleasant option? What would Apple do (WWAD)? There's a decent article in Business Week about how Clear Channel is trying to improve its image with niche channels such as Dank, Full Metal Racket, and Mother Trucker (Hip Hop and Rock, Heavy Metal, and Southern Rock). It's all part of the move to HD radio, which allows individual stations to offer side-channels of focused genres. It's going to be an uphill climb. The hatred that spawned ClearChannelSucks.net is tough to erase. $200 HD radios are too expensive to warrant trials by non-music-geek listeners. Clear Channel's content was not compelling enough or sufficiently in demand to prevent XM Canada from dropping all four Clear Channel's channels in response to mandated commercial spots. iRadio will only benefit from the programming battles, as content providers look for new distribution channels for their content. Hooray! The Motorola Q was finally approved by the FCC, so we may be seeing it soon after several delays. The specs for this thing rocks -- it's a CDMA EV-DO handset running Windows Mobile 5 for Smartphone. A QWERTY keyboard, bluetooth, 1.3 Megapixel camera and SD slot all grace this superphone's feature list. Another good sign -- a photo of the phone (shown above) was displayed on Verizon.com (but has since been pulled). Links. To great blogs, related sites, friend sites, etc. Photos. Pics. If you have any photos from conferences, demos, of new gear, Motorola or otherwise, that you'd be willing to share, let me know! eBay auction alerts. See what Motorola phones are about to be sold...and snag one. So what do you think? Any thoughts, suggestions? Comment here or email me directly with any thoughts you have. Cheers! When I wrote up the iRadio Brand Glossary to clear up the various products and services using "iRadio" in their name, I missed yet another iRadio brother, Vibes Media iRadio. This one's a B2B service used by radio stations to facilitate mobile instant messaging between radio DJs and their listeners. It's not exactly ocket science, but the company does have relationships with a lot of big players including Clear Channel and CBS Radio. The "iRadio Brand Confusion Factor" (I just made that up!) for Vibes Media iRadio, on a scale of 1 to 10, is 4. The fact that it deals with mobile phones, and is related to a music listening experience, are the primary sources of confusion. Otherwise, Motorola's big phat "M" should help keep customers straight. MotorolaFans is a forum community interested in open source applications for Motorola phones. If something involves Linux and a Moto handset, these guys are all over it. Registered users get access to a bunch of cool stuff including emulators, skins, wallpapers, multimedia, hacks, etc. Definitely check it out if you're interested...the site is signing up about 50 new users daily, and growing. Well, I'm almost finished updating the layout for iRadio Waves. The design and color scheme will be the same, but there will be not two, but THREE columns! (Mind you, as a non-web designer, that's quite a feat.) Plus, I got a little API-happy and added a couple new Motorola iRadio-related modules to play with, as well as new links to related sites & blogs. Look for the new look some time this week...it will (NOT) blow your mind!! MOTO ME at the NCTA "National Show"
The National Show is the bland name assigned to the National Cable & Telecommunications Association (NCTA)'s annual "showcase and gathering place that unites the cable telecommunications industry for three concentrated days of networking." Motorola took the opportunity to show off its seamless mobility solutions in an enormous MOTO ME booth (shown right). Check out a long list of MOTO ME goodness (including iRadio) in Motorola's press release. Motorola CEO Ed Zander spoke on a panel titled View From the Top: Leadership Perspectives, and Nick Chakalos, VP Motorola Connected Home Solutions, spoke on the panel, Digital Domesticity: Why Cable’s Right at Home. You can check out photos and coverage of the event at the event's blog, the National Show Insider. Greetings! Having returned from a brief job search hiatus, I am now looking to catch up on some Motorola iRadio news. To kick it off, it seemed appropriate to start with something near and dear to my heart: a job opportunity. This position offers a unique opportunity to assist in the development of internal and external (consumer) web sites and interfaces for iRadio. Work with other members of the iRadio team (engineering, business development, marketing) to develop solutions to a variety of design-related projects. So, it looks like Motorola is getting even closer to launch...either that, or they're behind schedule, and are hence looking for more people to build it. Check out the full job details here. Well, CTIA Wireless 2006 is now over, and Motorola CEO Ed Zander will be returning home with a stack of coasters bling award plaques from the Emerging Technology Awards and Technology Marketing Awards ceremony. Add iRadio's honorable mention above to the DEMExpo "Best Radio Service" award, and you're got a nice set of bling for a service that hasn't even launched yet..! But a nice showing by Moto in all of its recent ad campaigns -- kudos to the marketing team. A side note worth mentioning, CTIA Wireless attendees voted the Samsung T509 camera phone "Best In Show"...as a direct competitor with the RAZR, and the slimmest US handset to date, it's worth checking out. Why didn't they call this phone the Motorola RUBR? Motorola made a couple huge announcements today at the CTIA Wireless conference. First, Motorola partnered with MediaBay to offer Audio Book content (including audio books, educational and language courses, audio newspapers, self help programs, and audio travel guides) and Classic Radio programming (including popular radio shows from the past such as The Lone Ranger and The Shadow) to iRadio subscribers. Second, Motorola partnered with AccuWeather to provide local weather forecasts for over 100 US cities to iRadio listeners. UPDATE: The 101 weather channels, 70+ audio book channels, and 20+ classic radio channels are indeed all part of the basic iRadio subscription. That makes for roughly 620 channels of included radio programming...impressive! Sony BMG Music Entertainment became the third major record label to sign on with Motorola's iRadio music subscription service. As with the Unversal deal and Warner deal, Song BMG's huge catalog of artists will now be avaialable on any of iRadio's 435+ commercial free channels. 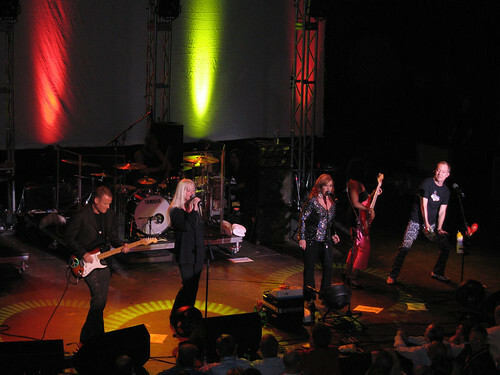 With Universal Music Group, Warner Music Group, and now Sony BMG having joined iRadio, only EMI Group remains to sign. That announcement will probably arrive soon -- the Gorillaz, which are an EMI Group band, recently partnered with Motorola to provide media and technology at a series of Gorillaz concerts...so, at least some kind of relationship between EMI and Motorola is already in motion. According to the analyst, " The iPhone will likely be as disruptive to the existing carrier market as the iPod was to the mobile music industry. When the iPhone adds VoIP capability, it will be even more disruptive to carriers." Spring 2006 is much closer than the 1-2 year waiting period many were assuming for a potential Apple iPhone and Mobile Me launch earlier this year. 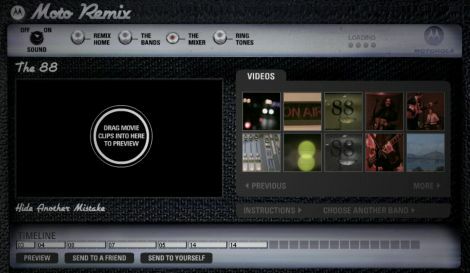 iRadio's big value props were the use of a phone as the central music delivery unit, and the seamless listening experience between car, home, and on-the-go. If iPhone indeed launches within the next few months, it's going to be quite a contest: iRadio vs. iPhone vs. Satellite Radio. Michael Gaumond, Vice President and General Manager, Digital Media Services, will be speaking at the Mobile Entertainment Summit on Tuesday about "The Future of Mobile Entertainment." Dave Ulmer, Senior Director, Marketing, Digital Media Services, will be participating in the "New Revenue From Mobile Music" panel on the same day, along with representatives from MSpot, Gracenote, Merrill Lynch, Crisp Wireless, and IDC. Be sure to check them out, and look out for some of the big iRadio announcements hinted at earlier (new talk radio channels...etc...? ).